We have a follow-up for root canals. Once we’ve completed your root canal we’ll send treatment records to your Restorative Dentist. Please contact their office for follow-up for root canals. Your follow-up root canal consultation should be done within a few weeks of your root canal procedure. Your Restorative Dentist will decide which dental restoration will protect your teeth. Endodontic patients rarely have complications after their routine treatments or microsurgery. If you experience any problems with your root canal contact us immediately. And continue to practice good dental hygiene. The cost of root canals depends on your specific needs. The cost of root canals depends on the amount of damage to your teeth and gums. Root canal cost is cheaper than dental implants or tooth replacement. We have different payment options to cover the cost of root canals. Don’t put off getting the dental help you need. Contact us for a free dental consultation. Our experienced office staff will help you come up with a plan to cover the cost of root canals. We look forward to giving you better dental health! Dental implant surgery is needed to put in your dental implants. Our dental implant surgery procedure is safe. 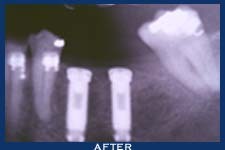 Dental implant surgery is done in two phases. Dental implant surgery places dental implants into your jawbone. For 3-6 months after dental surgery dental implants bond with your jawbone. You’ll wear temporary dentures and eat a soft diet. While you wait your dental implant specialist will form your replacement teeth. The second phase of dental implant surgery begins after the bonding to your jawbone. Dr. Michael Yeh will surgically place the dental implants and replacement teeth. No one will be able to see the dental implants or posts. They will see your new and attractive replacement teeth. Our dental implant surgery procedure takes 6-8 months. Most patients will have minimal interruption to their daily life. Please contact us for more information.